Edward Hicks (1780 Attleborough /Langhorne, Pennsylvania – 1849 Newtown, Pennsylvania) was from an old New England Puritan family. The family’s Tory connections made life difficult for them after the Revolutionary War, and Hicks was sent to live with a Quaker family. Later in life, Hicks would become a Quaker minister. Hicks apprenticed with a coach maker, and when he set up his own shop, he had the ability to paint not only coaches, but also signs, furniture, fireboards and clocks. He eventually settled with his wife and children in Newtown, Pennsylvania. He began writing his memoirs in 1846, and they were published posthumously in 1851. Hicks successfully combined his duties as a craftsman, an artist and a preacher. 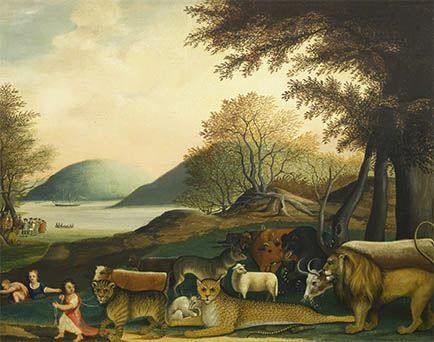 As an artist, he devoted himself to one subject, which, by current estimations, he represented some sixty times: the Peaceable Kingdom, illustrating Isaiah’s biblical prophecy that “the wolf also shall dwell with the lamb, and the leopard shall lie down with the kid . . . and a little child shall lead them.” Because, to Hicks, the United States represented the full promise and realization of the prophecy, he added in the background a depiction of William Penn negotiating his peace with the Indians. Although he treated a small number of other subjects, notably farm landscapes toward the end of his life, Hicks returned to the Peaceable Kingdom again and again throughout his lifetime. Hicks’s earliest known Kingdom, dating from 1816-1818, demonstrates the technical prowess he had gained from his work painting coaches, signs and other practical objects. By the time he completed his last renditions of the subject, his skills had grown to such an extent as to equal or surpass those of most academic painters. Unlike his academic peers, however, Hicks was not painting for painting’s sake—he was, rather, giving form to his vision. Hicks is, perhaps, the greatest of all the nineteenth century nonacademic painters. As was the case with most nonacademic artists, he adapted and improvised from academic subjects and forms, which were borrowed from printed or photographic sources. The printed sources for each element of Hicks’s Peaceable Kingdom have been identified by art historian Eleanore Price Mather. From these, Hicks attained an extraordinarily harmonious synthesis of adaptation and improvisation. He transformed the printed images to create his own fresh, highly refined representations.